A lot of backpackers look at pillows as luxury items and leave them behind because they are too heavy or bulky. 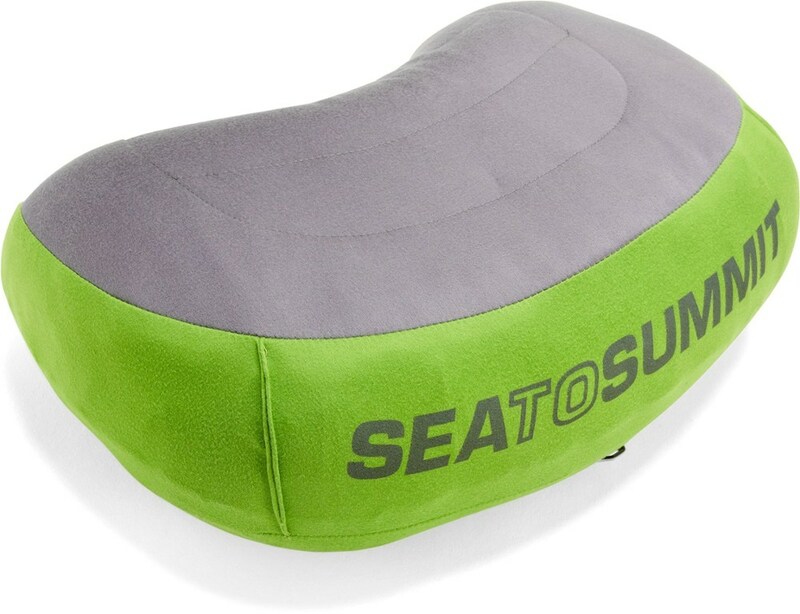 The new Sea to Summit Aeros Premium Pillow is definitely a luxury item because it affords its users serious comfort and support, but it weighs less than four ounces and compresses to the size of a lemon. 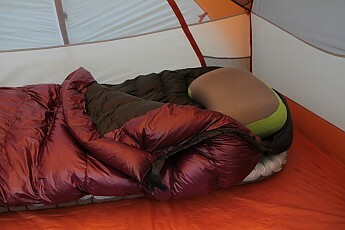 Even more surprising, is that it has five and a half inches of loft and almost covers the width of your sleeping pad. For side-sleepers who require extra loft and support, this pillow is a necessity. 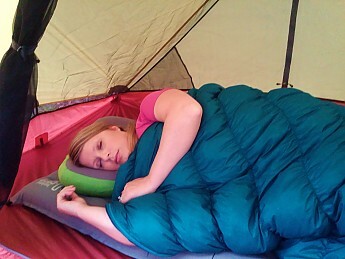 This multi-purpose pillow is great for both backcountry and travel use. The Aeros is offered in two sizes, the regular and the large. I tested the large. 14 x 10 x 5 in. 16.5 x 11.5 x 5.5 in. When I received the Aeros to test, I was shocked to see how small and lightweight it was. After I pulled it out of the stuff sack, I was also really impressed with how soft the outer fabric was and at the size that it expands to. I showed my husband the Aeros and he was so impressed that he went to REI and bought one for himself the same day because he said he had to have one! 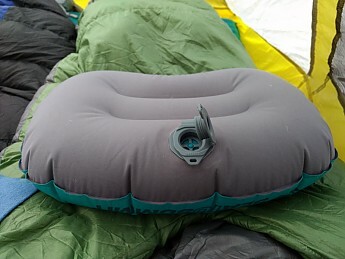 Sea to Summit ergonomically saves weight by making a hybrid two-in one inflation/deflation valve, as opposed to having one of each valve, like similar backcountry pillows. 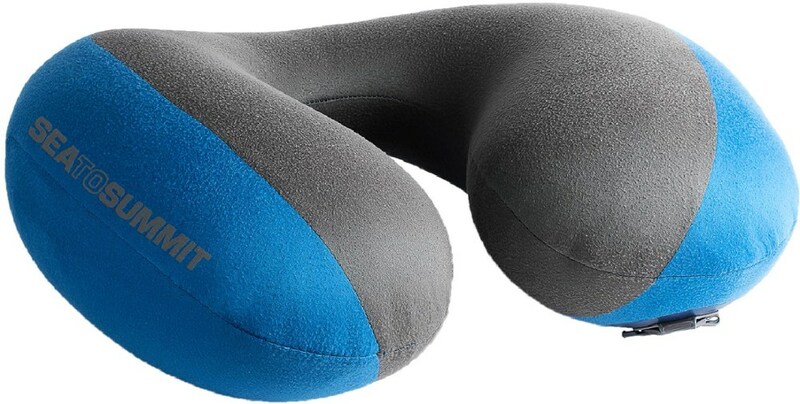 The Aeros Premium Pillow inflates with just two to three breaths and deflates instantly. It also packs away very easily in its stuff sack. 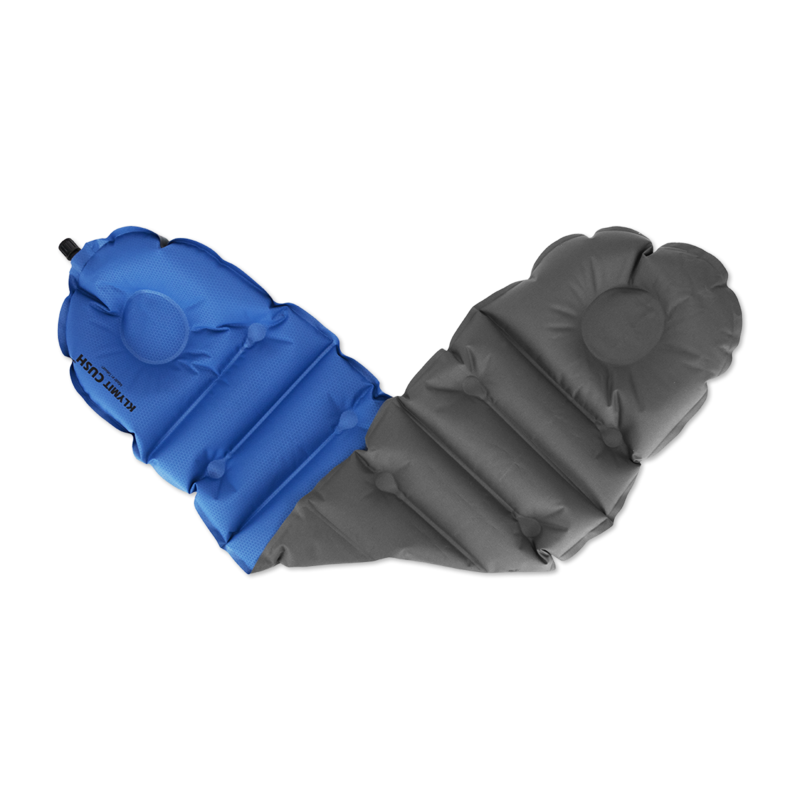 I have encountered some backpacking pillows that are difficult to stuff in their stuff sacks, so I can really appreciate the ease of which the Aeros stuffs in its sack. Curved internal baffles cradle your head, while a scalloped bottom edge centers the pillow around your shoulders to offer more support for optimal positioning of the head and neck. 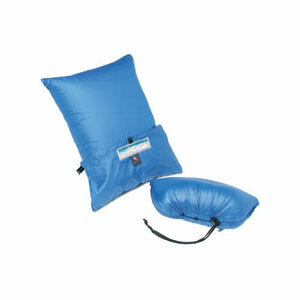 This pillow inflates to 5.5" and offers tremendous support evenly throughout the pillow. I think that the strength of the bladder, fabric, and valves are all great. However, I am not impressed with the stitching on the seams of the pillow. They could use another round of reinforcement. A small tear occurred on one of the seams. I tested this pillow most of this summer. I slept on it five nights while camping in temperatures from 70-50 degrees. 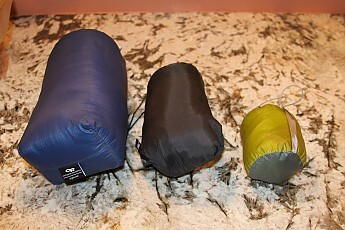 I tested it with a Big Agnes Insulated Q-Core pad and a Montbell Super Spiral Down Hugger #3 sleeping bag. No doubt about it, these were the most comfortable nights I’ve spent in the backcountry. I found the Aeros to be very comfortable and very supportive. I am a side sleeper, so a firm, high loft pillow is what I prefer. I tested it while sleeping on my side, back, and stomach. I found the Aeros to be comfortable in every sleeping position. As a side note, I also have bone spurs in my neck, so pillow selection is not something I take lightly. I was very impressed with the softness and moisture-wicking ability of the polyester knit outer shell. It did a great job of wicking away perspiration on warmer nights. The polyester shell felt super soft against my skin. Imagine having a jersey-knit pillowcase in the backcountry. I also had initial concerns that the bladder or air bag might be noisy when not fully inflated. I found it to be quiet. I did not have any issues with durability of the bladder, which is always a concern I have with air bladder pillows. I found it to be most comfortable when just under fully inflated. The lowest temperature I slept on the pillow was 50 degrees. Since I was not able to sleep on it in cold conditions, I can't say how much difference the insulation made, but I am glad that it does have it. Anytime I am sleeping on an inflatable pillow, the valve function is always a huge concern for me. The Aeros did not leak any air and I never had to readjust it in the night. I also used the Aeros multiple times on the couch and in the car on every road trip I went on this summer (including a 2,500 mile drive from South Carolina up the East Coast to the White Mountains in New Hampshire and back). It was wonderful to have the extra comfort and support in the car. It will definitely go on my next flight with me, as well. 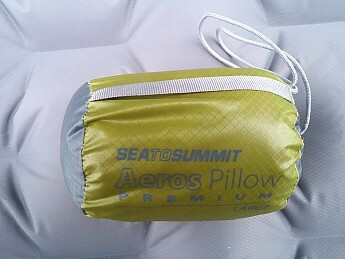 The Sea to Summit Aeros Pillow is what I consider one of the must-have new items of 2014. From its impressive size-to-weight ratio to its outstanding comfort and support, this is one item that can't be left behind. I already had a comfortable backpacking pillow, but this game changing pillow will be in my pack to stay. I do think that it has a high price tag, but I generally think most backpacking pillows are expensive. It is right on par with its competitors, but is much more comfortable than all others that I have tried. Thank you so much for taking the time to read my review. 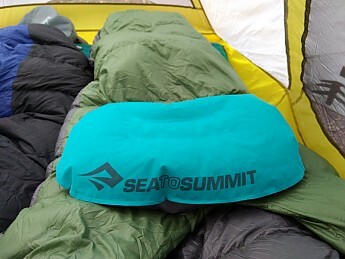 Thank you to Sea to Summit and Trailspace for the opportunity to test and review the Sea to Summit Aeros Premium Pillow. *Specifications from manufacturer's website, www.seatosummit.com. "The most comfortable nights I’ve spent in the backcountry." Wow, high praise for this pillow, Ashleigh! I admit I wondered if it was noisy when I looked at it, but am glad to hear it wasn't. Thanks for testing it and for the review. Great review, Ashleigh! Comfortable and compact sounds like a winning formula. For me, a good night's sleep can be a "make or break" situation for the rest of the next day. Thanks! Thanks, Alicia! It really made a big impression on me! Thanks, Daniel! The same goes for me. Unfortunately, I have spent a lot of nights in the backcountry with minimal sleep due to not being able to get comfortable. As of now, those nights are over! You may have convinced me that my habit of using dirty socks rolled in bandanna as a pillow falls a little short! Great review! Thanks, Seth! I used to use a similar pillow (stuff sack instead of bandana) and for me, this is a huge upgrade. Great review Ashleigh. I'm a side sleeper as well and getting the right amount of cushion has always been a struggle. This pillow has been put on the new gear wish list! Great review! I splurged and bought the large one for backpacking, but love it so much for packing size and comfort that it goes with me on all my trips. 4 OUNCES! That's more than my cookset weighs! ;) Nice review, Ashleigh, but I'm going to keep stuffing my down jacket into a stuff sack and using that. I own this pillow. There is essentially no noise. Period. How you value a pillow is linked to how you value sleep. I have not had any problems with the seam stitching. Used it many times and so far it's like new. 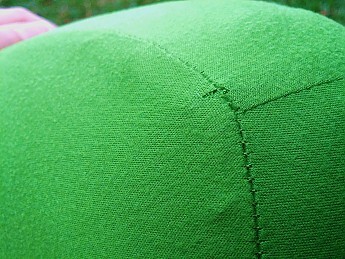 This stitching problem may be a variability in production or an initial production problem?? Mine is absolutely fine and used on about 8 trips so far. A luxurious blow-up pillow with a brushed outer finish that is soft and smooth to the touch. The excellent 2-way valve makes getting just the right pressure very easy. Having had my 8-year-old pillow spring a seam leak on a July trip to the Trinity Alps I knew with a 16-day PCT section hike coming up in August it was time to go shopping. Popping down to my local REI to see what they had in stock, the Sea to Summit Aeros Premium Pillow jumped out at me immediately. I was taken by how much more sophisticated pillows had become. 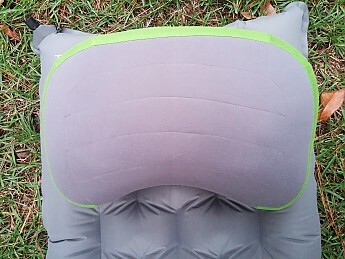 Rather than just a blow-up oval pillow similar to what I was replacing, the Aeros has a scalloped shape so I could tuck it nicely around my shoulder. They have even installed curved interior baffles to more completely support the head. 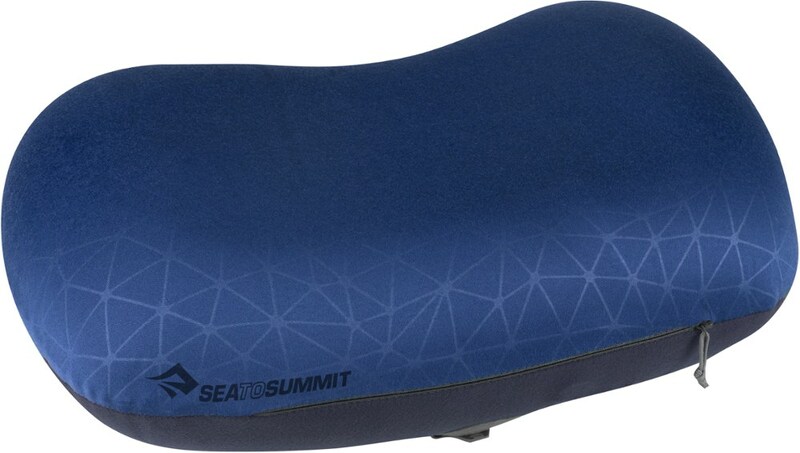 Not content with just making a simple air bladder, the Sea to Summit Aeros Premium Pillow places a synthetic filler between the bladder and the outer layer of 50d brushed polyester. This means you don't need a pillow case because this pillow is super soft to the touch. I continue to use a flannel pillow case out of habit, but it's certainly not necessary as the Aeros is washable. When soiled, just inflate and hand wash with a mild soap with the valves closed and air dry. 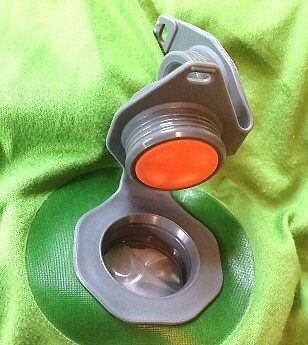 Store the pillow flat with the valves open when not in use. Speaking of the valves, the one-way inflation valve allowed me to really dial in the amount of air I had in my pillow. 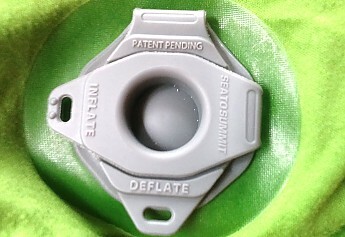 Deflation is as easy as popping open the deflation valve. While the Sea to Summit Aeros pillow is not inexpensive, how much is a good night's sleep worth? For me, the answer was $42.95. After 16 nights of quality sleep during my section hike I think the Sea to Summit pillow was worth every penny. The quality of the pillow's construction should keep me sleeping well for years to come. Thanks for the pillow review, Steve. It's a great pillow, Steve, and thanks for the review. 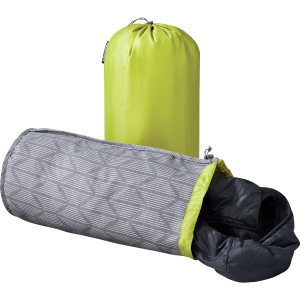 I've used it on a few trips and super light and packable. Thanks, also for the tip on storage. I did not think to do that, and will! I need a dedicated pillow. Having a good night's sleep is one of the most important things to me when camping. This pillow far exceeds my expectations. I have searched forever for the perfect pillow. I have been using a Slumberjack 14" x 16" pillow I purchased many years ago. It compresses fairly small (5" x 10" and weighs 12.65 oz.). The pillow is extremely comfortable and was a hard choice replacing it. I will not do without a pillow, I have tried and don't like it. I need a dedicated pillow. Having a good night's sleep is one of the most important things to me when camping. I will usually stuff some clothes under my pillow to raise the pillow a bit. I also had a Slumberjack 10" × 20" pillow and it was too narrow. It would compress in half making it feel like you were wearing earmuffs. I had the Therm-a-Rest pillow and it was horrible. I won't go into a review... it is just horrible... TRUST ME! The actual weight is 4.2 oz/ 119g and the label that comes with the pillow says 4.0 oz 114g, I just wanted to point that out in case any gram weenies read this. For a pillow, this is extremely pricey, however if you are really trying to lighten up and conserve precious real estate in your backpack, then this is for you! From a comfort standpoint, the Nemo starts off feeling more comfortable due to the extra padding, but the Aeros wins out if you toss and turn and / or a side sleeper due to the height (thickness). Both are great pillows, but the Aeros definitely trumps with the weight and size alone. The Aeros is quite a bit thicker so may appeal more to side sleepers, I have to prop up the Nemo with clothing when side sleeping, this is not the case with the Aeros. You can't beat the weight and size. It's about 3" x 3-1/2" this would fit inside a 450 ml mug. Inflation took 6 average puffs, there is a three way valve type thing or at least that's what I call it. You pull on one tab that says inflate to inflate, open the other tab that says deflate to... yep you guessed it, deflate. There is some sort of check valve that allows air to enter but not escape this not only makes filling easy but allows you to adjust the firmness of the pillow by pushing the valve button in with your finger. I fully inflated mine and after about 30 minutes let out a bit of air to adjust for my comfort level. To deflate you just pull the deflate tab and all the air whooshes out in about a second or two, I then roll up the pillow start stuffing in the stuff sack making sure the deflate is still open and facing the opening of the stuff sack, when its almost stuffed all the way in just close the valve tab and secure with the cinch cord and clip. The price tag is a bit high but if you are trying to save some weight and precious real estate in your pack, this is a good choice. So far nothing has beat my Flannel Camp pillow, that is the most comfortable pillow I have ever slept on. "Brendan T. Byrne State Forest"
I found my sweet spot with this pillow. Inflation and deflating is a breeze a few puffs of air and its ready to go, deflating takes a second. I ditched the stuff sack and store the pillow directly in my sleeping bag before stuffing inside a compression stuff sack. Rain, with a tiny bit of snow and hail. 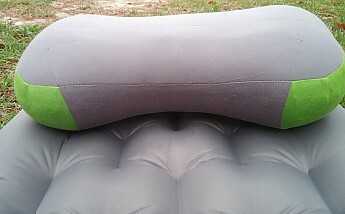 Three days on this pillow, I only inflated it the original day and it lost a little bit of air due to cold. I have been playing around with a spongier fill and I prefer it over the harder inflation. It took a while for me to find my sweet spot as I like the pillow fully inflated for height but it was a bit hard and it felt like I could not get my head high enough up on the pillow, before my shoulders hit the pillow, due to no taper (too thick). Well, I found My Sweet Spot! I fully inflate, then deflate so it's spongier feeling, stuff between my Therm-a-Rest mat and Western Mountaineering MegaLite bag. There is minimal slippage...and it is extremely comfortable. Pillow is usually kept between the sleeping bag and the air mattress, it is on top for the picture. There is minimal movement and I need to tuck it back under my head when I toss and turn a bit. The pillow is at its most comfortable if you stay centered on the pillow. 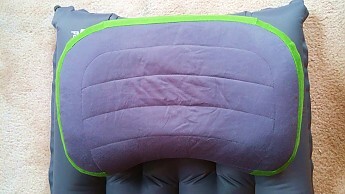 The Aeros is stored inside the sleeping bag with no stuffsack when deflated. Thanks for the detailed review, Richard! I agree with you, the Aeros Premium is awesome! Thanks for the review, pics, and video, Richard. Thick, light, non-slip, and the best I've found. 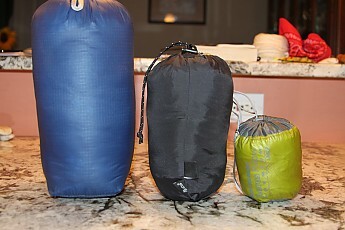 I've had five or six backpacking pillows and have tried using rolled up clothing. Each of these had problems. Rolled up clothing unrolls or is lumpy. Some inflatables are too thin, or have slick surfaces that allow them to slip out from under the head, or are too heavy and bulky, or some combination of the three. The Sea to Summit Aeros (regular size) is immediately likable. It weighs 2.8 ounces and packs down into its tiny stuff sack to fit inside my camp cup. 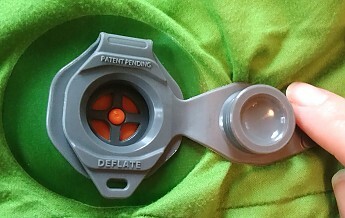 It has a dual purpose inflation/deflation valve. 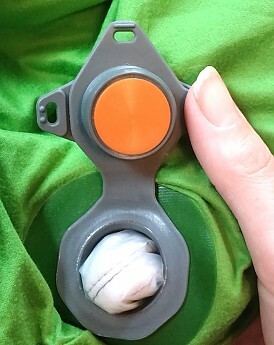 Pull off the main air cover to inflate and the big one-way valve doesn't allow air to escape. When you wish to deflate pull off the secondary layer in the valve cover and it deflates instantly. It's easy to make the pillow soft or quite hard and thick (5 inches). 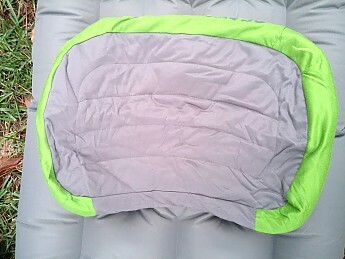 The surfaces (both sides) are covered with a light fleece that feels good to the skin and reduces slippage on the tent floor or sleeping pad. 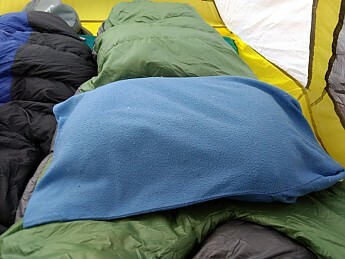 Also, it provides a non-clammy surface in cold weather, though for snow camping I'd probably insulate the pillow a little with a jacket, though I've not yet tried it for that. There is a larger size that's 5 1/2 inches thick and weighs 3.7 ounces. At REI the regular is around $40. I got mine on sale for about $27. I think I've bought my last backpacking pillow. Thanks for the review, Mentalfloss. Glad it's working for you. 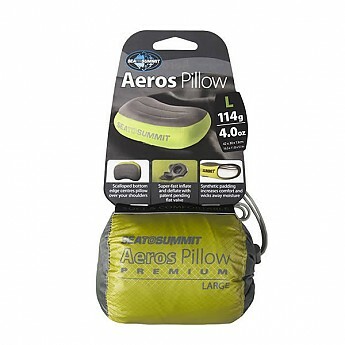 I have a few camping pillows too, and like the Aeros the best. Just like you, I like that it's not slippery. I normally use mine at only about 25-30% inflated so that my head sinks in a bit. I'm not a huge fan of the green color of the outer cloth, but it is very soft and comfortable! Wonderful pillow. Light, compact, comfortable, and great to improve any camping experience. This is really a great pillow for camping. It is comfortable. The lining on top is soft without being too thick, which for me means my head doesn't sweat all night like it has with other pillows. It is very compact and would work for all camping conditions. Whether you are car camping, or trekking into uncharted trails, this is so light and compact it will go anywhere without taking up much room at all. It stays well inflated throughout the night. And the outside material is soft, so there are no sounds made by the pillow. And it stays in one place through the night. There are only two potential "negatives." The first is that, as the pillow is inflatable adjusting to your comfort level involves blowing it up to your preferred firmness, which is good. But while inflating it, the valve is a one-way valve, so you cannot let just a little air out. When you deflate, it is essentially pulling the plug on the whole pillow and deflating the whole thing. So if you over inflate, you have to start again. But given that it only take 3-4 breaths to fill the whole pillow to maximum firmness, this isn't big deal to me. I will also note, I like a firm pillow and this can be very firm. Also, I have kids, so having different colors would have been nice, since each kid wants their own pillow and is convinced their sibling is taking "their" pillow. But these are minor issues and I would still rate the pillow 5. Thanks for sharing your pillow review, Troy. Good product overall, pretty expensive but definitely gets the job done. This is a good quality product. 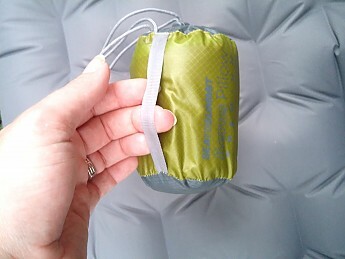 The main selling point for me was how it packed into almost nothing, the size of a fist—very important for backpackers. The material is good quality and the area you put your head down on is soft. There are separate intake and release valves to let air in and out, so it is very easy to fill up. The only thing that it loses points on is price. It was around $44 at REI—much more than any pillow should cost. Welcome to Trailspace Charlie. I've always just stuffed a down jacket into a bag for my pillow needs. I can't imagine paying that much for a pillow! Thanks for sharing the review. Unbelievably light and packs really small. Have always used synthetic pillows, just purchased the Aeros for a 4-day trip to Letchworth State Park. The weight savings alone make the pillow an excellent buy, but the size it packs down to is what really amazes.